Mix all glaze ingredients in small saucepan; set aside. Heat oven to 350 degrees F. Heat oil in medium skillet. Add onion; saute for 3 minutes. Add garlic and saute for 1 minute. Set aside to cool while preparing remaining ingredients. Whisk eggs with yogurt, Worcestershire sauce, mustard, pepper sauce, thyme, salt and pepper. Turn meat mixture onto a foil lined shallow baking pan. With wet hands, pat mixture into a 9 x 5- inch loaf. Brush with half the glaze. Bake loaf until meat thermometer registers 160 degrees, about 1 hour. 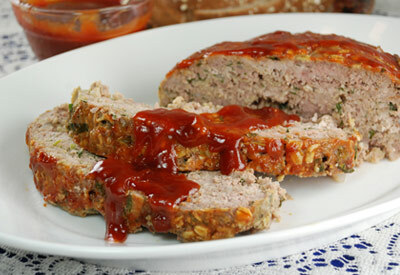 Remove from oven and let meatloaf rest for 10 minutes before slicing. Simmer remaining glaze over medium heat until slightly thickened. Slice and serve with extra glaze and Dijon mustard.